The sharp flap of leathery wings signals an incoming message from GDC: SOE have released a trailer for Dragon's Prophet, a free-to-play fantasy MMO that seems to have been developed with the design philosophy "more dragons = better". It's a theory that didn't do Skyrim any harm. 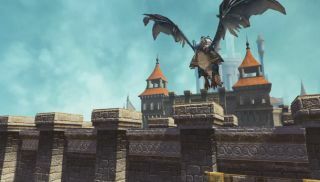 The game's feature page offers up some more details, although unsurprisingly the headline point is "Dragons Everywhere". But other than the winged wyrms, Dragon's Prophet also promises action-based combat with "a unique auto-target and combo system", extensive player housing and a "Frontier" system for guilds. Oh, also: dragons! Supposedly, the dragons you capture will go on to shape the progression of your character's role. Dragon's Prophet is currently doing the VIP access thing, giving you the option to pre-order for guaranteed access to the beta (due to start no later than April 15th), as well as (surprise!) "exclusive dragons". You can also apply for beta access without paying, which seems like the sensible thing to do, although developer Runewalker say access is "extremely limited".